There is clearly new evidence that has not been discussed before and that did not appear to form part of the legal cases that concluded in 2014. Will this be enough to persuade US and world public opinion that the Museum acted improperly and had and have not established its moral right to hang on to the object? It is interesting to look at the docket of the El Salvador MOU renewal public comments which has no coiney or metal detectorist nonsense. The first comment to have gone up last night was a brief one from that Paul Barford chap. This was followed by one by Leila Amineddoleh, on behalf of the Lawyers' Committee for Cultural Heritage Preservation (LCCHP). Unfortunately this one would not open for me (temperamental computer day). No doubt it said all the right things. Then it was the turn of Anita Difanis, representing the Association of Art Museum Directors, which was followed by "Anonymous, Anonymous" on behalf of the Association of Art Museum Directors (Oh dear... "Please substitute this document for the one filed earlier today on behalf of the Association of Art Museum Directors” ). It's a closely-argumented and footnoted text, but the attitudes that come through I find appalling. Read it for yourselves and decide what you think of these people's attitude (to a simple request from a little nation to restrict certain types of imports to items with the two kinds of paperwork envisaged by the CCPIA). The highlight is (currently) the last, a really well-argued one by Karen Olsen Bruhns, well worth reading (especially the last paragraph). It is heartening to see this time, in contrast to many other recent public submissions to the CCPIA process, the relative lack of dealers and collectors attempting to defend their “rights” to profit from cultural property brought in from other countries without being required to document licit export. 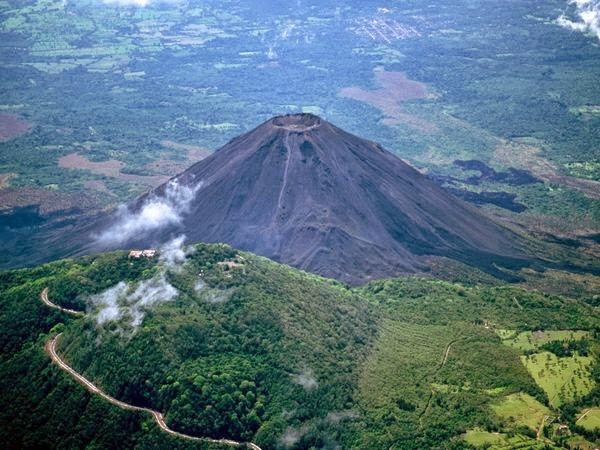 The Republic of El Salvador was an early ratifier of the 1970 UNESCO Convention (February 1978) and has long attempted to take legislative and administrative measures consistent with the Convention to protect its cultural patrimony. Obviously, in the very fact that it has asked the good people of the USA to help it continue to regulate the outgoing trade in certain categories of archaeological material from its Prehispanic cultures, El Salvador regards its cultural patrimony to be in jeopardy from pillage and illegal transfer of ownership. Who would want to deny them, on what grounds and by what right? 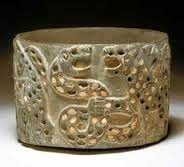 It would therefore be only proper for the US to continue to apply import restrictions in accordance with the CCPIA with respect to this archaeological material for as long as is necessary. This would be in line with those measures already automatically applied by all other countries who are States party to the 1970 Convention (Art 1-26). This would be of substantial benefit in deterring any cultural racketeering, pillage, and smuggling of such artefacts, which is consistent with the general interest of the international community. It is only a shame that the US, almost alone among the 127 States Party to the Convention, implements the 1970 Convention so selectively and at the same time subjects fellow States Parties to this humiliating process of remote assessment by a Washington committee. Please agree to El Salvador's request. Department for Culture, Media and Sport, 'Culture Secretary makes appointments to Treasure Valuation Committee', Gov.uk, 29 September 2014. Apparently the Department for Culture, Media and Sport considers the magazine "The Searcher" to be "produced for amateur archaeologists". The Egypt Exploration Society, quick off the mark, have published this 'Statement on The Loss of Antiquities from Public Collections (29th September 2014, authored by Dr Alice Stevenson, UCL Petrie Museum of Egyptian Archaeology, and the Society's Director, Dr Chris Naunton). This is prompted by the news that on Thursday 2 October 2014, the Archaeological Institute of America (AIA) St Louis Society intends to sell Egyptian antiquities at the London auctioneers Bonhams which had been excavated in 1914 by the British School of Archaeology in Egypt (BSAE). The EES condemns this sale in the strongest possible terms. Export was permitted from Egypt to London by the Egyptian authorities under the terms of the contemporary excavation licence, and these particular objects were subsequently sent to the USA on the condition that they went to a public collection. The AIA St Louis Society, an independent not-for-profit organization, received the items in exchange for their financial contribution to the excavations of the BSAE. The regulations of the BSAE stipulate quite explicitly that any antiquities granted to it by the Egyptian authorities were to be distributed to “public museums”. [...] Many other objects were distributed to public collections in the UK, USA and elsewhere by the BSAE and Egypt Exploration Society (EES) on similar terms and remain in those collections today. [...] Museums and archaeologists are stewards of the past; they should not sell archaeological items in their collections for profit. Public museums offer the best hope that ancient objects are safeguarded against loss or deterioration to their condition, and that they will remain accessible to scholars and the wider public for study and enjoyment. Objects which are sold on the open market may be transferred to collections which are not required to provide such safeguards, and which have no obligations to make the material they contain accessible.[...] We appeal to all museums to declare: (i) their opposition to any sale of antiquities from public museums into private ownership where the integrity and access to objects is at risk; (ii) their strong disapproval of any auction house, museum, archaeological society or other public body that is involved in such sales. The statement is also available for download in pdf form, here. Any attempt by museums or archaeological societies to profit from sales of antiquities provides incentives for global criminal activity that can lead directly to the loss of the art they claim to value. [...] the global networks start and end in the galleries of London, Brussels, New York, Paris, Zurich and elsewhere. Eh? I simply do not see how putting verifiably (because catalogued) legally-sourced antiquities onto the market in any way 'provides incentives' (how?) for global criminal activity - ie the passage of illegally-sourced artefacts onto the same market. The galleries of "London, Brussels, New York, Paris, Zurich and elsewhere" surely should be encouraged to seek supplies of artefacts of known legal origins. they were leaving lots of unwanted finds by the side of the hoik holes, instead of adding them to the collectables in their haul. This is an excellent illustration of the sort of selection that goes on when a fragile and finite part of the archaeological resource is treated as an artefact mine. Heritage Action are also not surprised to learn: "unfortunately our FLO could not be with us because she was returning from her honeymoon in Italy", not half as much as the commercial artefact hoikers who'd apparently not checked on FLO availability until the last moment when it was too late to make other arrangements. 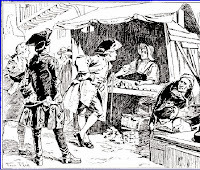 Focus on UK Metal Detecting: An Attempt to Hang on to his Treasure Reward? No longer visible. At the digger's request? An attempt to hang on to his Treasure reward? Bonkers Britain. nah, "not in it fer the munny", remember? Syria and Iraq: Heritage Training for Fighters? Larry Rothfield ('Protecting heritage in Mesopotamia Redux: Will the US military get it right this time? ', The Punching bag Saturday, September 27, 2014) focuses on the suggestion (see here) of Bonnie Burnham of incorporating heritage protection training into American efforts to train Syrian rebels and Iraqi military personnel. All well and good, and yes, please. The problem is that I have a nagging suspicion that all the media attention to heritage destruction in the region recently and all the heritage rhetoric we heard at the Met in Kerry's speech is really a front, a 'vanilla' way to whip up outrage (the 'Bamiyan Effect') and does not in any way represent the real priorities driving the renewed US intervention in the region. It's like the Colin Powell anti-Saddam UN speech with a phial about the fearsome WMD-which-never-existed. There are many fakes or dubious items on the market [...] but people have to stop throwing mud at dealers just because they are against the perfectly legal practice of collecting. Hi, I suspect you have misunderstood the sense of what I wrote. Personally, I would expect Mr B. (like other dealers do) to have some broadly-formulated statement that all his goods have been legally-sourced and "sold with a guarantee of clear title" as well as being guaranteed as authentic (not fake). Have a look though what he actually guarantees on the page to which I linked.That is the point I was making. What one makes of that is another matter. As for the question of guarantees of authenticity. Frankly, if you are guaranteeing something, I think that what is required is a statement which back that up which goes further than "because I say so". We have all seen that there is a difference between an "informed opinion" (casus two 'Cabinet W' coins) and a cast-iron fact-supported guarantee - for example the availability of a report detailing what scientific analyses have been conducted by whom, when and what the results were. This applies in particular to artefacts where the seller is not providing full and verifiable collecting histories to show that the object concerned is fully 'grounded' to use Elizabeth Marlowe's term. Collectors seeking guaranteed authenticity should obviously demand either one or the other, and preferably both just to be sure. "I think they did the right thing[,] I want to dig what I find that's way (sic) I go[. T]hey put the hard work in[,] so [I] can't see the problem[. G]ood for them to have found a hord (sic) that's grate (sic) if I find a hord (sic) I'm digging it out to and have a look inside to see what's there lol"
Samira Saleh al-Naimi was kidnapped by masked ISIS militants on 17 September after she allegedly criticised on Facebook the militant group’s destruction of places of worship in Mosul, Iraq. She was then tried for apostasy, which for the militants is considered to be an act of abandoning Islam by converting to another faith, or by committing actions that are against the Muslim faith. She was tortured for five days and having been sentenced to “public execution” was killed on Monday. Her IS abductors took her to a public square in the center of Mosul on Monday evening and shot her. Her Facebook page appears to have been removed since her death. According to the Gulf Centre For Human Rights, Al-Nuaimi was "a prominent lawyer and human rights defender and famous for her activities that include defending detainees and supporting the disadvantaged families in the city". Gulf Centre for Human Rights, 'Iraq: Lawyer and human rights defender Samira Saleh Al-Naimi executed by ISIS in Mosul', 23rd September 2014. Note: There was contradictory material released on the Internet suggesting this story was false, but sadly the news has been confirmed, though the photo widely used of the victim in current news reports was of another woman with the same name. 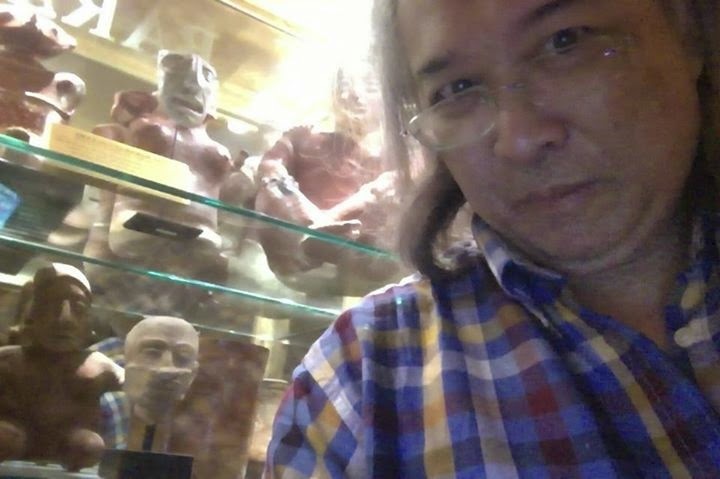 In a shop in the Emirates Palace hotel in Abu Dhabi, apparently a stage on the outward journey of many antiquities of global origins, "you can buy better Mesoamerican antiquities than in a New York gallery", says Somtow Sucharitkul, artistic director of Opera Siam, currently on tour. The shop belongs to Bakarat (branches in London, Beverly Hills and Abu Dhabi). "The Barakat Gallery unconditionally guarantee the authenticity of all the works of art as described" (that's it). Even here, on what basis? No scientific tests - or existence of separate 'condition reports' - are indicated in any of the sales descriptions. "looting has turned Syria’s heritage sites into “weapons of war,” with the sale of antiquities fuelling the conflict” - Open letter signed by more than 150 scholars. If you feel you can write a better blog, go for it. There is plenty of room here for everyone and it is always good to have a wide variety of views and beliefs to read about. Indeed, but the problem is that one can readily see (for example from the content of their forums) that many artefact collectors find it difficult articulating a coherent body of views and beliefs. They mostly feel more comfortable parroting what other collectors say, ignoring a large proportion of the relevant issues, meaninglessly mouthing façadist sentiments they feel are expected, and with aggressively deflecting reasonable discussion with puerile ad hominem and slanderous comments. They are less comfortable articulating a reasoned and frank discussion of what they and their fellows do without falling rapidly into cliché and generalisations. Mr Mentalcase could no sooner produce a well-argued blog of his own than he could say 'sorry'. Lol so many negative reviews. Yes, it's amazing isn't it? Although absolutely nobody writing in three pages of that thread mentions they'd seen the comments of any archaeo-blogger (let alone critical remarks from the PAS), the 'popular posts' app in the left sidebar and the tracking of the people reading the post on this blog shows quite clearly that quite a few metal detectorists have taken an interest in external discussion of the topic. "they shuldn't of done it like that". They obviously want us to forget the previous reactions to the news and think this is the opinion of all 16000 UK metal detectorists. In the group of, I think, 21 detectorists around that hole seen or heard in that video, only one is heard to be suggesting the archaeologists should be brought in, but he is quickly shouted down. Less than one in twenty. So is this a regional thing? Metal detectorists north of the Humber being differently outreached-to by the London-based PAS? Or it is actually that the majority of detectorists would be of the same mind as those detectorists on that thread saying "if it's my find, I get to dig it up" and the posing is only a righteous façade for public consumption? The worrying video on the ‘Dunelme hoard’ may be gone, but the issues it raises will not go away. The 17000 signature petition calling on the UN to ban trade in Syrian artefacts which some readers (and even some FLOs) may have signedwill be delivered, together with the open letter signed by 150 scholars, to the members of the United Nations Security Council next week. It asks the U.N. to take action similar to the 2003 decision during the Iraq War to ban sales of Iraqi cultural property. Lucy Westcott, 'United Nations Ban on Trade in Syrian Antiquities Urged by Scholars', 27th September 2014. Focus on UK Metal Detecting: Licence to what? Clinton Devon Estates is a 21st century rural estate and property business. Responsible stewardship and sustainable development are at the heart of everything we do. So, they will be explaining then why they are issuing "licences" for erosive and non-sustainable collection-driven exploitation of the fragile and finite archaeological resource on their land at Seaton Down. I am sure they will also gladly point us to the records of responsible reporting mitigating the erosion resulting from previous searches of the same land under these "licences". The PAS search engine appears not to be able to demonstrate this. The pot was delivered to the flo the next day and the finder was praised for excavating it intact and not emptying it. It was then picked up straight away by the museum who couldn't wait to get there (sic) hands on it. Yes it would have been nice to leave until the flo was ready to attend at a later date but then it could have been a post entitled, Hoard found and then night hawked and lost forever. Unless of course the searchers put into action the contingency plans that they had previously responsibly formulated for just such an occurrence. All it needs is to drive a car or tractor onto the field straddling the hoard findspot and put it in gear with the handbrake on, and nobody is going to get at it. Put Mr Tattoo and a friend in it with a big stick, a thermos of soup, some sandwiches, his mobile and arrange for someone to come and relieve them at three and the hoard is safe from all [except perhaps Mr Putin and his infiltrating polite little green men]. I cannot think what the FLO is doing "praising" them for this hoard hoik - has she seen the video like the rest of us? Nigel Swift, 'Now Weyhill Fair, Oh Dear' (27/09/2014) is probably about the only person in the UK to be at all concerned about yet another commercial "charity rally" being held tomorrow targeting the known site of the Weyhill Fair. I used to pass there daily and thought of it as history personified: 750 years of almost continuous gatherings including the country’s largest sheep fairs (100,000 sheep sold a day at the peak), mentioned in “The Vision of Piers Plowman” (1326) and held on land partly owned by Chaucer (it being quite possible he heard some of his tales from characters at the Fair). Thousands turned up for all sorts of other reasons including hiring workers and all manner of entertainments – probably jousting, sword fighting, dog-baiting, bear-baiting, cockfighting and strolling minstrels. There were also Mystery Plays and mummers. By the sixteenth century it was so large it had an on-site court to settle disputes and deal with lawlessness and thereafter it expanded further to include a horse fair, cheese fair and hop fair. 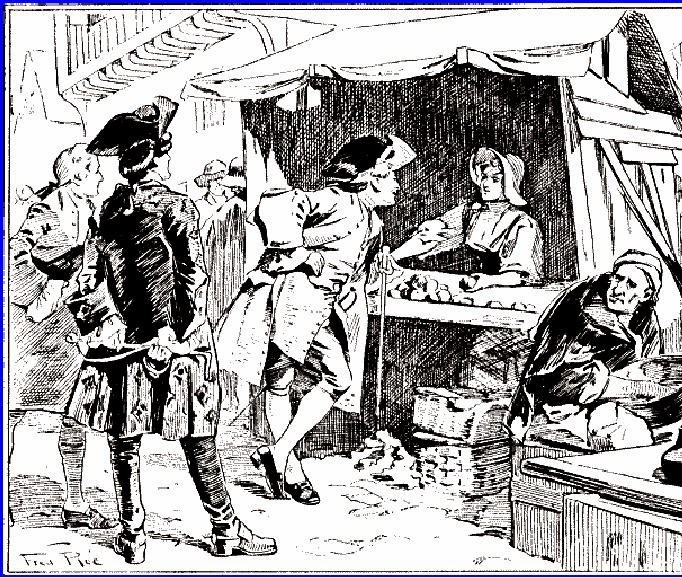 There were even said to be cases of wife-selling there as immortalised by Thomas Hardy in the Mayor of Casterbridge.[...] “Sites really don’t come better than this!” [...] Everything dropped on those 60 acres forms an almost unique whole, a continuous record of social and commercial interaction in one small place over seven and a half centuries and crucially, “undetected”! 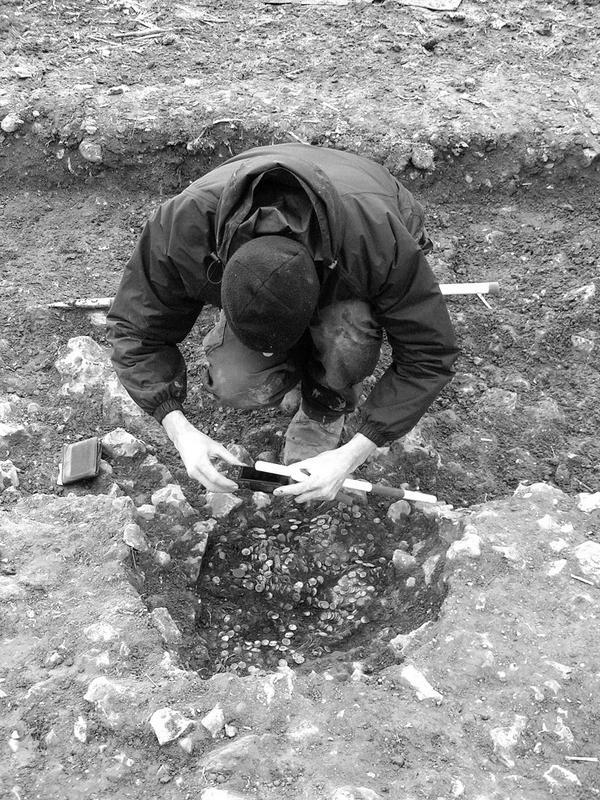 So it’s just crying out for a comprehensive archaeological field survey one day – including, by all means, the use of metal detectors, but conducted entirely in accordance with EH’s “Our Portable Past” standards for professional investigations so as to maximise the intellectual yield for us all. Yet that is not what is going to happen. Tomorrow ninety collectors will descend on the site and crudely rip out and take away whatever random collectable items they can get their hands on, leaving the rest of it meaningless. A surface assemblage of possibly unique importance trashed, so somebody can raise a thousand quid to give to some charity to make everyone involved feel that bit better about themselves and earn another pat on the head from society. This is being done for purely selfish reasons. Club members pay twelve quid go home with a handfull of finds that, though mostly fairly mundane, if we looked them up on the "Wot's it werf" page of the hobby magazine "Searcher" could be worth fifteen to twenty pounds each at a minimum. At that rate, if the weather is good, hundreds of such collectables worth together well over the amount raised for charity will be going to enhance the monetary worth of a whole load of collectors, and the farmer is left with nothing. This is nothing short of a scandal, yet the archaeological establishment in Britain maintains its usual unconcerned silence as the archaeological record is decimated from right under their noses. Why? If some of the finds dribble back to scattered FLOs are the finders going to hear "you done well" from the Portable Antiquities Scheme boots-on-the-ground? "When are Steve Israel and Charles Rangel going to tell the world that they were wrong, listened to the wrong people and failed to use their critical facilities when they lent their names to plans to help cultural property smuggling into the USA?" If they did, we missed it. US lawmakers, please do not support cultural piracy. Keep the antiquities trade lobbyists at arm's length until you've investigated what it is they want you to agree to and why. For its entertainment value, this video of "a newly discovered tomb in Jordan FULL of golden idols and at least two mummies" beats metal detecting videos. It seems like the Jordanian 'lead codex' creators have just got a tad more ambitious, branching out into plaster, gold paint and brass in somebody's cellar. Spot the little grey alien at 1:26 among the gross imitations of assorted Egyptianising funerary items. It’s a sordid story from start to unfinish. It involves one — possibly three –murders, a professional smuggling operation, a lord, a former chairman of Sotheby’s, three governments, soil sample analysis, robust detective work from Scotland Yard, and the obtuseness of the Manhattan District Court. So far there is only one positive development. Seven pieces of remarkable Roman silver were returned to Hungary earlier this year after its government parted with 15 million euros for something that clearly belonged to them in the first place. The report rehearses the version of the story that has a silver hoard being discovered in 1978 by József Sümegh in Polgardi (around 60 miles south of Budapest), and then being found dead. In 1980 some of the pieces of the treasure, including vessels bearing inscriptions, surface on the market in Viennea. The retired chairman of Sotheby’s, Peter Wilson buys some and in 1982 another investor, Lord Northampton (he of Sekhemka fame) acquired five more items from the same hoard. In total, 14 pieces were known. The investors could not sell the objects. Their first port of call was the Getty Museum in Los Angeles, who rightly balked at the lack of provenance and the discrepancy in the export licenses from Lebanon. The Getty’s curator Arthur Houghton, could read Arabic and spotted the anomalies at once. The licenses were faked. In 1990 the consortium tried their luck with Sotheby’s in New York, still claiming the works were found in Lebanon. The Lebanese government then laid claim to the silver, asking for its 'return', followed shortly by Yugoslavia and Hungary. Patrick Boylan published a story showing it had been illegally removed from the source country, and the Treasure was impounded in New York, and then a Manhattan court examined the issue of who could rightfully claim it. The verdict was that Lord Northampton had been "seriously misled over its discovery, export and potential sale to a major museum" and in 1994, the treasure was returned to him. For a while the treasure disappeared from view, they briefly appeared on show in Bonhams in London in October 2006. Then in March 2007, The Art Newspaper reported that a further “187 silvergilt spoons, 37 silvergilt drinking cups, and 5 silver bowls”, previously unknown, but part of the original hoard, were reputed to exist. At the beginning of this year, seven pieces of the treasure were sold to the Hungarian government by Peter Wilson's sons, "and Lord Northampton has been left holding a very valuable baby". In Iraq, black market dealers are coming into areas controlled by the Islamic State group or in safe regions nearby to snap up items, said Qais Hussein Rashid, head of the state-run Museums Department, citing reports from local antiquities officials still in the area. [...] [At the] grand palace at Kalhu, from which Assyrian King Ashurnasirpal II reigned in the 9th century B.C., [...] "They are cutting the reliefs into small parts and selling them, [...] They just need a chain saw to cut the king's head or legs if they want." Recently they carved off a relief depicting a winged demon holding a sacred plant and sold it abroad, he said. "It is now beyond borders." Obviously it is dealers on the ground in these regions who are playing a large role in financing this process and paying the taxes to ISIL. They do so because they count on retrieving their investment by selling to other dealers and collectors. Collectors then would be the real looters. It should be noted that the dealers mentioned 'coming into areas controlled by the Islamic State group' will necessarily be in good relations with them - collectors, do you know who has had those antiquities before you? But their extremist ideology doesn't prevent them from also profiting from the sale of ancient artifacts, either by selling them themselves or taking a cut from thieves who are increasingly active in looting sites, [...] In civil war-torn Syria, looting of archaeological sites is believed to have increased tenfold since early 2013 because of the country's chaos [...] For example, the 2,300-year-old city of Dura Europos is being pillaged. The site is in one a cliff overlooking the Euphrates near the Iraq border in an area under the Islamic State group's control, and satellite imagery taken in April show it pockmarked with holes from illegal digs by antiquity-seekers. Images showed hundreds of people excavating on some days from dawn to nightfall, with gunmen and gangs involved, [...] Dealers are at the site and "when they discover an artifact, the sale takes place immediately,"
Many of the objects are then smuggled out of the country to receptive markets. What Kind of Report has the PAS written for AC Archaeology ? The Seaton Coin Hoard record created between 8th and 9th September has now been unhidden (PAS-D7EA4C). It was excavated by AC Archaeology, but the report on the finds seems to have been done for them by the British Museum. The presence of a possible container was suggested by a number of ferrous fragments around the main coin deposit and by fragmentary remains of possible organic fabric preserved below the coins at the base of the pit. The irregular and lozenge shaped form of the coin deposit suggests a flexible container, perhaps a fabric or soft leather bag. [...] The exact total is uncertain due to two fused blocks estimated from their weight (2491 g and 880 g) to contain more than 1,000 coins. Added up to the 21,271 coins sorted by date and mint, the total number of coins is between 22,000 and 23,000. The millionth object recorded on the PAS Database is a coin belonging to the hoard. This is coin no. 1,061 in the sequence, as it happens a nummus struck in AD 332 at the mint of Lyon (Gaul). It shows the personification of Constantinopolis on the obverse and a Victory on prow on the reverse. This very common type was struck by Constantine the Great across the Empire to celebrate the inauguration of the new city of Constantinople which was to become the capital of the Eastern Empire. and the obverse and reverse of the official PAS photo of the "millionth find" don't match. 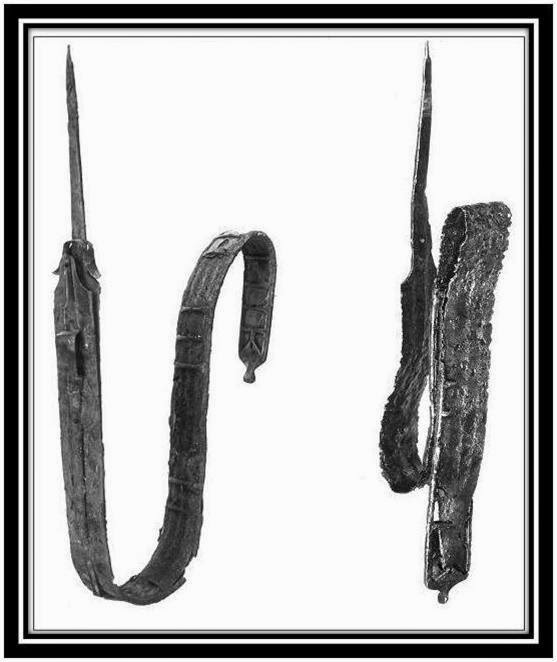 "Three large, heavy pieces" of bloomery iron were associated with the coins, but are not properly documented in the PAS record. After all, there were lots and lots of luvverly coins, eh? Who gives a tinkers about recording iron manufacturing waste from a site when there's TREASURE to be found, eh? Likewise there is no record here of the "number of ferrous fragments around the main coin deposit" thought to be associated with the container, and the "fragmentary remains of possible organic fabric preserved below the coins at the base of the pit". Just the collectable items, the coins. What kind of archaeological report is that? Why are only some of the associated objects reported by the finders selectively included in this record? One hopes AC Archaeology insists that the job is done properly. There is a lot of superfluous narrativisation in the PAS 'report' which also needs editing for missing words. PAS Milliongate: Roman Grot is "Millionth Find"
Portable Antiquities ‏@findsorguk 2 min. On the occasion of the publication of the Portable Antiquities Scheme Annual Report 2013, its one millionth find recorded is announced. The find is a Roman coin in a hoard of 22,000 others dating to around AD341 found in Seaton, Devon. [...] The recording of over one million objects on http://finds.org.uk since the Portable Antiquities Scheme (PAS) was founded in 1997 is testimony to the enormous success of the scheme, which allows finds discovered by members of the public to be recorded for the benefit of researchers and the public alike. There, I was right, a so-called Roman grot. Pour encourager les autres. The copper alloy coin, called a nummus, was struck in AD 332 at the mint of Lyon (Gaul). It shows the personification of Constantinopolis on the obverse and a Victory on prow on the reverse. 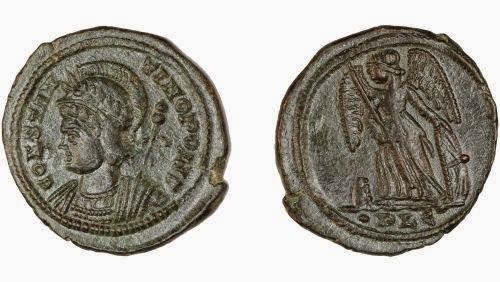 This very common type was struck by Constantine the Great across the Empire to celebrate the inauguration of the new city of Constantinople which was to become the capital of the Eastern Empire. The rest of the text is a typical piece of PAS-fluff and spin, but interestingly reveals the great extent to which compulsory reporting under the Treasure Act has been responsible for the "wotta-lotta-stuff-we-got" figures. Voluntary reporting by artefact hunters, once held to be the mainstay of the database, now recedes into the background as emphasis shifts from the broader picture of use of the landscape to individual spectacular finds of gold and silver. From the site to object. This is a very worrying reorientation of the conceptualisation and public representation of archaeology. "raise awareness of the educational value of archaeological finds in their context, and promote the care and protection of the historic (sic) environment on a local level". Artefact hunting in its current form erodes the historical environment and our ability to study and understand it. The PAS is providing very minimal mitigation of its effects on the archaeological record, both at the macro and micro-level. "One million" finds recorded from this is nothing compared to the numbers which may reasonably be thought to be being lost through collection-driven exploitation of the archaeological resource. But I bet that's not going to be mentioned today in the self-gratulatory speeches and photo calls among the canapés and sparkling white wine in plastic flute glasses in the gallery today. Seaton Hoard, Dug Methodically by Archaeologists: Finder Slept in his car on Site Protecting it From Other metal Detectorists. 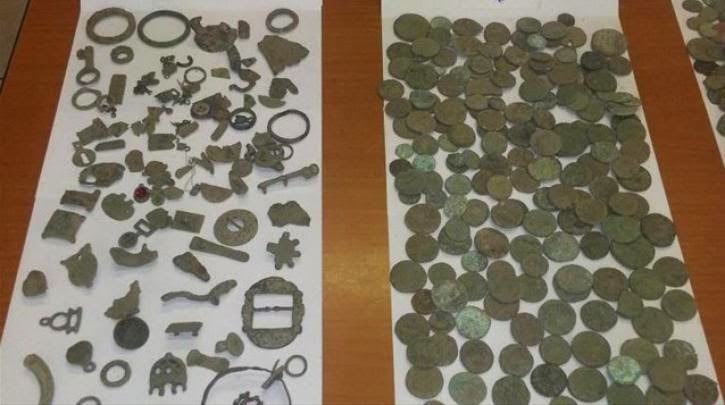 "of approximately 22,000 copper-alloy coins" was found near the previously excavated site of a Roman villa at Honeyditches in East Devon in November 2013. 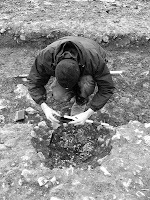 Realising the significance of the discovery, and that much of it was in situ, the finder (Laurence Egerton, 51) immediately contacted the landowner (Clinton Devon Estates), as well as Danielle Wootton (Devon Finds Liaison Officer who is based at the University of Exeter) and Bill Horner (County Archaeologist). This prompt and responsible action ensured the coins were properly excavated and allowed for the later recording of the hoard and its context at the British Museum. Seaton Down is the largest hoard of coins of the 4th century AD from Britain to have been properly recorded through the PAS and was declared Treasure earlier this month. It appears that the coins were buried together as a single group in a small isolated pit, the lozenge shaped form of the coin deposit suggests the coins were buried in a flexible container, perhaps a fabric or soft leather bag, though this has not survived. The combined weight of the coins is 68kg and they have been lightly cleaned at the British Museum prior to valuation under the Treasure Act 1996.The coins range from the late AD 260s to the AD 340s, a period of much turmoil in Roman Britain. 99% of the hoard are nummi, common coins struck between AD 330 and AD 341. The group terminates in AD 347-8 during the joint reign of Constantius II and his younger brother Constans, sons of Constantine I. Constans was the last legitimate emperor to visit Britain. "Initially I found two small coins the size of a thumbnail sitting on top of the ground. I decided to dig the earth at that spot and immediately reached some iron ingots which were laid directly on top of the coins. The next shovel was full of coins - they just spilled out over the field. I had no idea how far down the coins went so I stopped immediately and phoned my wife to come to the site with a camera. Between finding the hoard and the archaeologists excavating the site I slept alongside it in my car for three nights! "You done Well" Mr Egerton. I hope the Kent FLO is paying attention. Bill Horner (County Archaeologist, Devon County Council) too in getting a team together in three days to deal with it. * Ha, at the time of writing, record PAS-D7EA4C is still hidden. Published on 26 Sep 2014 by " muddybandit1"
First we see two detectorists dancing around the spot where it seems something had been found, with their findspouches dangling like masonic aprons, round and round they go chaotically stabbing the earth with their spades. They are digging sideways. Spoil is being cast all around and right on the edge of the hoik hole, tumbling back down onto the area exposed, they've broken the pot already (00:49). There is very little checking the upcast for loose coins. The soil is coming out in large solid lumps anyway as the men hack deeper and deeper down around the original hoik hole. 3:50 out comes a squeaky pinpointer. 4:19 random grubbing around in the loose soil fallen back into the hole. At 4:40 there is discussion of there being a second pot in the side of the hole ("they buried them in threes"). 5:54 nobody came prepared: "anybody not gotta lit'le trowle?" The whole thing is being hacked out with spades. At 5:55 we see that they are well aware that they are trashing archaeology, it stops there" the man with the pinpointer declares, stabbing it with the tool "that's their hole". The sun is starting to get low, photography's going to be difficult soon. By *:30 they're obviously going for the Donut technique cutting down around the ring of soil where they suspect the pot lies (though the man with a shaved batman design on his head ['Andy'] suggested a minute earlier the pot was on its side). 9:38 they then start attacking the donut, brutally, with a spade. By 10:10 it is quite clear what they have ("bloody hell, there's 500 coins there, there may be another pot next to it") and that spades are not in any way the right tools to explore this. If before there was no reason to call the thing off and protect the site until archaeologists could come with more suitable tools and methods, then this is it. Indeed, two minutes later, one of the onlookers said, "tell you something,... we should be marking it and leaving it, get the archaeologists in now" . He's shouted down by a coarse voice "it want diggin' aht mate!" . There is a cacophony of 'helpful comments'. They think its an amphora... and they still insist there are three pots. Nobody on site seems to have the contact details to the landowner, why not? Chaos, utter chaos. "Responsible detecting" this is not. Typical of many other cases however it may well be. What has the PAS to say about this? Another "You done right"? Come on, where is this outreach? Actually the PAS is out of the office, sipping bubbly and nibbling canapés in Bloomsbury today, celebrating a hoard that was not hoiked out like potatoes. Here we see how the hole looks after more digging, they've dug straight down around the pot (ignoring where they saw the edge of "their hole"). Then after the group photo we saw earlier, they lift the pot out onto an extempore bed of straw. The raggedy hole is scanned for more metal, then left. At 6:47 they detect another metal signal from deep in the subsoil ... but then the film breaks off. Perhaps just as well. Apparently, you can see some "Detectorists" clips here, but they do not seem to want to open in Poland at the moment. 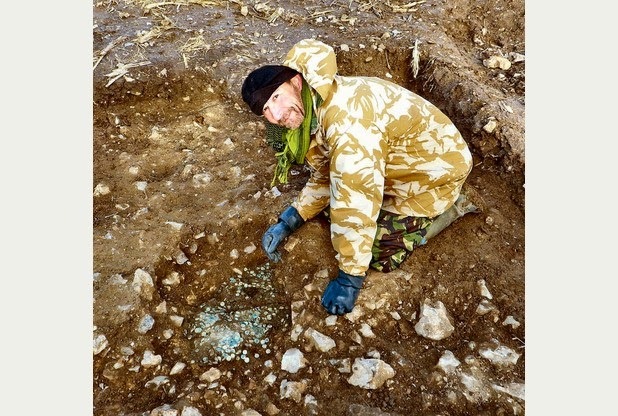 Focus on UK Metal Detecting: "We Are the Good Guys"
Holedigger Pete the detectorist from Kent really has problems grasping what the problem is with the way artefact hunting goes on in the UK. He thinks the problem is with getting the right kind of propaganda. Like many metal detectorists he thinks that if metal detectorists stress what good and nice guys they are (ambassadors for the hobby - not something Mr Holedigger has been consistently good at in the past), then everyone will turn a blind eye to everything else. A sort of black and white dichotomy, they do not assault old ladies, so everything they do must be OK. So last night he sent me this rather pathetic comment to my discussion of the ‘Dunelme hoard’ fiasco. Holedigger Pete uk has left a new comment on your post "Focus on UK Metal Detecting: Hurried Hoard Hoiking...": Hi Paul, why don't you say anything good about people detecting? We do other things like raise money for charity, the club has raised over £5,000 for a children's hospice over the years. Last Christmas all members brought a present for the children of the hospice. This year we have raised money for breast cancer as this has effected (sic) my life. Tomorrow I hand over £160 raised by club members for breast cancer so as you can see we are all not that bad as you make out us to be. Just to let you know calling us baboons make us laugh as you are no better than us. All the best Pete. 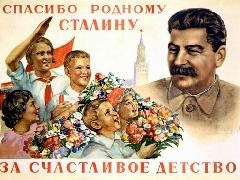 Many dictators have been portrayed by their propaganda as friends of this or that group, Stalin and Hitler for example with children, Stalin, the peasants. Most of us are intelligent enough not to be misled by the imagery in these cases. A small one-day commercial artefact hunting rally might charge £10 quid from 100 participants ( £1000) on a site offered by a farmer for free thinking he's being generous because the proceeds "go to charity". Yet if 95% of those people finds a few bits and bobs which (by the valuations proffered by "The Searcher") are worth a minimum of fifteen to twenty quid each, then they are going home laughing. The heritage loses a whole lot more from so-called "charity rallies" pilfering the archaeological record. I really do not see why from a conservation point of view we should be awarding any kind of collection-driven exploitation of the archaeological resource any kudos points at all. The activity is erosive, and is typically carried out in a damaging manner, wherever the money generated by commercialising it goes. Focus on PAS: Homo who? Portable Antiquities @findsorguk · 14 godz. Actual record DOR-57AD64 says: Date: Middle Palaeolithic - 60,000 to 30,000 years BP (58,000 - 28,000 BC), so where does "45000 years ago" come from? The PAS record does not say anything about geological position or associated (eg faunal, palaeoenvironmantal) marker material. So why specifically Neanderthals? The PAS record itself says that recent criticism has tended towards not treating bout coupé handaxes like this "uncritically as a Mousterian marker fossil", and recent work (for example at Grotta del Cavallo, Puglia) seems to be pushing the arrival of non-Neandertahal homo saapiens back to the 44000 BP timerange to which the PAS arbitrarily (?) date this object (a chance find on cultivated land). The PAS may envisage themselves as lording it over the paying public as some omniscient 'experts' who pull their "facts" from a magical expert black box. They say it was "45000BP" and "definitely Neanderthals" and they expect the forelock-tugging public just to accept this is not "guesswork" and pay up. I think though that if they were serious about their outreach role (a) they'd explain how they/we know what they/we know in the case of this isolated loose find, and (b) give more nuanced information and (c) would show a little intellectual honesty in NOT deleting comments on their tweets questioning what they say without providing any further justification to what they say. This is what they've been doing when I have been asking for more transparency on previous dumbdown statements in the #PASmillionth thread. A million artefacts and zero explanation? Is that what we all (archaeologists included) get for seventeen million pounds of public money? Why ignore the issues all the time, is it not time to give a better account of yourselves instead of constant dumbdown spin and dodging the questions and blocking out the questioners? According to a comment on Peter Tompa's blog today, in the UK "detectorists helped put the PAS firmly on the map". Again we see there the same old lies that through the PAS "the State pays fair market value for what finds it wants to keep". What nonsense. I'm not linking to that stuff, Google him and then look up for yourself what the PAS does and what it is for. More than 80 prominent archaeologists and other scholars from around the world have signed an open letter calling on the United Nations Security Council to ban trade in Syrian antiquities, a market they say is now destroying Syria’s cultural heritage and providing funding for extremist groups. “Our shared world heritage in Syria is being looted and turned into weapons of war,” the letter says. “Ancient sites dating back to the very earliest moments of human civilization are being crudely dug up and sold to foreign collectors.”[...] In a speech at the Metropolitan Museum of Art on Monday, Secretary of State John Kerry said that “ancient treasures in Iraq and in Syria have now become the casualties of continuing warfare and looting.” “And no one group has done more to put our shared cultural heritage in the gun sights,” Mr. Kerry said, than the militant group known as the Islamic State, which now controls parts of Syria and Iraq. The open letter regarding Syria, which has been torn by more than three years of civil war, is an effort led by Amr Al-Azm, an assistant professor of Middle East history at Shawnee State University in southern Ohio. Source: Randy Kennedy, 'Scholars Call for U.N. to Ban Trade in Syrian Antiquities', Art Beat September 25, 2014.
a coin with a photographic scale? Ah, they are owning up at last to the sham, this at eleven in the morning of 25th September 2014.
so, um, it seems churlish to ask, but since the hashtag is called "#PASmillionth", which was "THE millionth"? Or are you going to ignore that question too? "1,024,567 objects within 634,042 records"
Portable Antiquities ‏@findsorguk 3 godz. ... and there is some reason why you cannot do it today? For the bean counters, you are only 24,722 objects too late. Pathetic. Portable Antiquities ‏@findsorguk 45 min. Hmmm. "ritually killed"? The database actually says: HESH-4CD185 "complete but recently broken" - death by metal detecting? 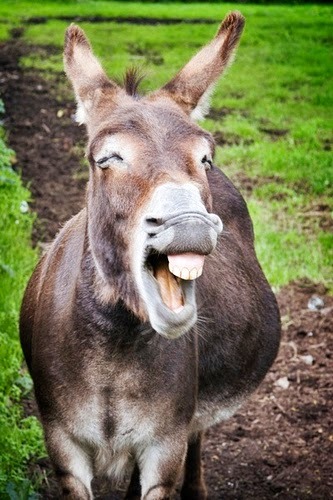 Perhaps the PAS would explain how archaeologists know this one was ritually killed, instead of being hit by a plough. Otherwise metal detectorists who gather from PAS outreach that "archaeology is all guesswork" would have a good deal of justification for thinking precisely that. What is the evidence from this loose decontextualised artefact that it is one that has been ritually killed? Why not use the opportunity to show how archaeological interpretations are constructed, on the basis of this find? It could be used to explain about "the educational value of archaeological finds in their context" to artefact hunters. So tell us about that context from the finder's own recording of the context of deposition. You did understand the question did you? We all know about "deliberate damage" to some deposited objects in the Bronze Age and later. What was asked was how you know in a decontextualised find this is one of them. The description says the break is recent. And, my comment politely requesting a bit more intellectual honesty sent as an answer to your tweet seems no longer to be visible there. Why? In fact, all the earlier ones too seem to be no longer visible. Either some mysterious technical gremlin, or an interesting display of the degree of openness in archaeological discussion which exists in the United Kingdom today. Can one discuss metal detecting and artefact collecting properly in the UK? PAS, I think you have the answer to that one. On the back of my comments about a news item in the public domain about how artefact hunters had treated an archaeological site over the weekend, the discussion continues. Yet another UK metal detectorist, this time from Dagenham attempts to explain the finer points of the methodology of recording of finds in their context, as the PAS have been ineffectually banging on about for eighteen years. He reminds fellow detectorists that they are all "ambassadors for the hobby" and that the general public will judge hobbyists from what they see in the media. If every time something like this happens artefact hunters present themselves as a group mainly composed of clueless and irreformable chavs, then the future of the hobby based on the image of a legitimating partnership does not look bright. Focus on UK Metal Detecting: Hole was "Quite Delicately Dug"
"if it was in say a wooden box delicate care is needed as the box is also evidence from the past, but in the case of a pot urn of roman coins that was obviously quite delicately dug I don't really see it as so much of a problem". and does he see the wooden box here? Tattoo man could well have his foot in it. It seems by "quite delicately dug" the detectorist thinks that the whole point of getting in archaeologists "with their cake slices" is so the pot (object) does not get broken. In his view, the hoikers did not break the pot (dug object), so everything is "OK". But British archaeology (and the detectorist's own FLO) are maintaining stubborn silence over this. I hope it is an embarrassed and thoughtful silence, because there is an issue here to be dealt with. Now I got this late in the evening, the FLO is out of the office, but has set it up for a machine to announce that anyone who has written will have to wait up to five days even to get an acknowledgement of receipt (I have not yet received one). Suppose somebody has to contact the FLO urgently, they've spotted a Roman coin hoard washing out of a stream bank by the road, or they've spent the last ten days recovering scattered Anglo-Saxon gold items from a field (in five days time their 14 days are up)? I am quite sure the FLO is overworked, but there has to be a system to deal with this issue. Otherwise people are just not going to go to the FLO as a first port of call. Let us see how many days it takes for an answer to come from this public servant. I never received a reply to my query from this public servant. Furthermore her employer a local authority funded museum, never learnt how poor a service she is offering to the enquiring public. This is what happens when instead of providing proper information when a loose object is being discussed, the Portable Antiquities Scheme all-too-frequently comes out with a piece of trite narrativisation in a dumb-down attempt to make it seem 'relevant'. "This razor showed people shaved in the past", "this toy soldier shows that Scotland is a natural part of the Union" and so on. Even the thickest metal detectorists - who cannot even formulate a grammatical sentence - can work out that this is just so much pseudo-academic fluff, worth nothing. In this as in other things, the PAS single-handedly is doing the public image of our discipline a very grave disfavour at a time when British archaeology least needs it. What is their strategy for dealing with this problem in the framework of their "outreach"? Reflections on a visit to a travelling exhibition of part of the recently-created Green Collection of Biblical manuscripts in Springfield, Missouri ('Passages: A Glimpse into the Hobby Lobby Family’s Bible Museum', by Rachel McBride Lindsey, Religion & Politics September 24, 2014). The installation in Springfield, which will run through January of 2015, is a professionally curated exhibit of approximately 400 artifacts ranging from ancient papyrus fragments to medieval illuminated manuscripts to a full-scale, operating replica of Gutenberg’s press. As the eager khaki-clad docents remind patrons, despite the expansive breadth of the traveling exhibit [...] Passages comprises a mere one percent of the Green Collection. Internal calculations gush that the entire collection amounts to “more than 40,000 antiquities [and] includes some of the rarest and most valuable biblical and classical pieces … ever assembled under one roof.” All told, Green has spent more than $23 million amassing his collection, which he began in 2009. The collection joins a trend in antiquities collecting by affluent evangelical enterprises, such as the Scriptorium exhibit at the Holy Land Experience theme park in Orlando, Florida, and the Dunham Bible Museum at Houston Baptist University, each of which asserts their academic qualifications to audiences both sympathetic and critical. That such collections are founded on evidence, and not faith alone, is the unstated claim. Passages emphasizes that artifacts have been studiously acquired through the counsel of the Green Scholars Initiative, an arm of the Museum of the Bible that includes “Distinguished Language Scholars,” “Senior Scholars,” and “Senior and Distinguished Scholars and Consultants” from institutions including Pepperdine, Baylor, University of Chicago, Oxford, and King’s College, London (among a host of largely evangelical liberal arts schools conducting GSI Projects). the good news affirmed by insiders and extended to outsiders: we are on the right side of history. The Museum’s collecting habits, exhibit curation, and academic efforts combine technological savvy and strategic planning to advance a particular history of the Bible in American public life. "Why not Turn a Blind Eye, Like all the Rest"? Focus on UK metal detecting: Two Codes. Syrian Archaeology, ‘Scale of the Scandal’. Green Collection and the "Oldest Known Siddur"
Focus on UK Metal Detecting: "Loathsome"
Is this Evidence of Ancient Time Travel? ADCAE Dealer from the UK "Regrets"
Focus on UK Metal Detecting: Dysfunctional? Style, Design and Ethics in a "Bible Museum"